On Saturday night, I had the pleasure of cooking for 6 guys in their early 30′s. It was a blast. My brother Michael’s best friend is getting married on Labor Day and, rather than throw him a bachelor party with strippers and tequila shots, he asked me to cook the groom-to-be and some friends a dinner. In the past, I have donated dinners to a couple of auctions and for this night I decided to do one of my “auction worthy” meals. Five courses – appetizer, soup, salad, main, and dessert. I thought I was getting six carnivores, but in fact I got two vegetarians, two carnivores, one not-eating-much-meat-these-days, and my brother whose friends once sent him a Bacon of the Month Club membership as a gift. Enough said. I recently saw someone on Twitter say something along the lines of, “Why would vegans have restaurants? Clearly they hate to eat.” Now, aside from just being nasty, that statement is so clearly not true. If I knew that person I would invite them to check out The Millenium Restaurant in San Francisco – or at least their cookbook. Their food is so exquisite, so lovingly and respectfully prepared, I’m sure it would make that person retract their statement. Whenever I want to make something really, I pull out that cookbook or it’s follow-up, The Artful Vegan. Vegan? For a special dinner? Yes. For this dinner, I found inspiration from The Millenium Cookbook for the appetizer and soup recipes. Normally, if I am going to make five courses, I really try to balance the food so there isn’t too much of it. If I do a substantial appetizer, I make the salad lighter. If I do a filling soup, I make sure the appetizer is small and simple. Cooking for young men allowed me to just make what I want and not worry so much about appetites. If anything, I worried that I didn’t have enough food. But I am Jewish and that worry is stamped on my DNA. 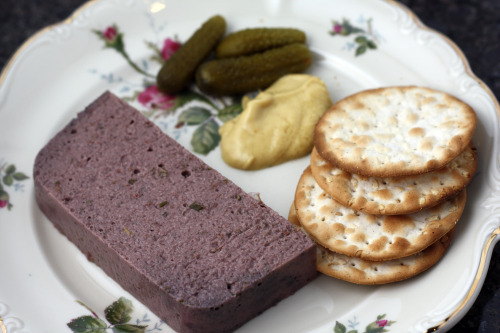 I had seen recipes for vegetarian pâté before and was always scared off by an ingredient that sounds like a character in the Star Wars movies – agar agar. Now, gelatin, which is used in many ways to firm things up – you find it in panna cotta, some mousses, marshmallows, even some yogurts – is not vegetarian. It is made from cow hooves so I avoid all things with it listed as an ingredient. Agar agar is a type of seaweed and it has the same gelling properties of gelatin. You can buy it in flake or powder form and I am here to tell you, the stuff really works. I had my doubts but no more. I found mine at Whole Foods. The Millenium Cookbook actually has four recipes for pâté, but I chose to make the one with mushrooms and walnuts. It seemed the most pâté-like and also the most hearty. As with any time I try a new recipe, I wasn’t sure it was all going to work but it did. It came together as it was supposed to, it came right out of the pan as it was supposed to and it tasted great. The only thing I changed is that I used pecans instead of walnuts because the guest of honor that night can’t do walnuts. Hopefully this recipe doesn’t sound too “out there” for you because it’s really very good. It makes a very special appetizer. The only other slightly odd ingredient in this recipe is nutritional yeast. You can find it in health stores or, my old standby, Whole Foods. It’s in the bulk section or the spice section. In a large skillet, heat up just enough olive oil to coat the pan over medium heat. Add the red onion, garlic, and mushrooms, sprinkle with salt, and sauté until starting to brown. Add the red wine and continue to cook over medium heat until all the liquid has evaporated. Remove from the heat. Add the sage, thyme, rosemary, nutmeg, pepper, and yeast and stir well to incorporate. Transfer to a blender. Add the walnuts, soy sauce, vinegar, and 1 1/2 cups of the water. Blend until smooth. In a small saucepan, bring the remaining 1 cup of water to a boil. Whisk in the agar agar and turn the heat to low. Continue whisking until the agar agar is thoroughly dissolved, about 5 to 7 minutes. Add agar agar mixture to the blender with the mushroom mixture and blend until incorporated. 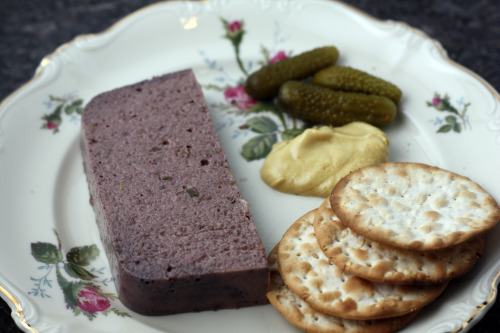 Test the pâté to ensure that it sets up by refrigerating 1 tablespoonful for 10 minutes. If the test pâté isn’t firm by then, dissolve another 2 teaspoons agar agar powder or 1 tbsp. agar agar flakes in boiling water and add to the pâté. Refrigerate for at least 2 hours and up to 3 days. Unmold and cut into slices. Vegetarian pate sounds fantastic! I want to try this, and I want that book. That looks as good as it sounds! Already bookmarked for the next dinner party! Since you mentioned it, I have to tell you about my experience with agar agar. I went to this vegetarian, hippie summer camp in rural Quebec when I was a teenager. Loved the camp, the food not so much. It was crazy hippie food – millet casserole and the like – once we even had these horrendous noodles with yeast sauce (even the cooks wouldn’t eat it and vowed never to make it again). This sounds delicious. Anything with mushroom is a winner in my book! I have never tried a pate, but this sounds delicious- especially the rosemary. Yours will be my first on my list! Looks good to me! Great appetizer! Ooo intriguing! I have some agar agar but have been scared to try using it because I’ve heard that it gels more than gelatin does? I really need to just try it though. And I need to check out those 2 cookbooks! I can’t believe someone said that about vegans. How strange. rather than using agar, could i just use gelatin? sorry if that offends you, i’m not a vegetarian, however mushroom pate sounds very intriguing to me. Adding a tablespoon of brandy or dry sherry always helps. That was always my favorite part in regular dead cow or chicken liver pate when I used to eat that stuff.